As-salamu alaykum and hello everyone ♡. 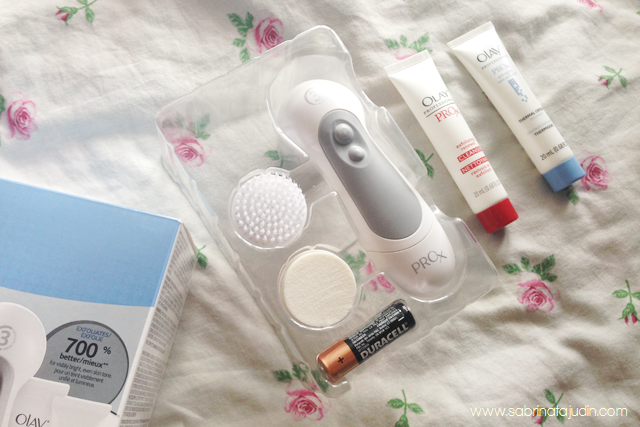 Another facial tool review! Since the last one I have review, now I am reviewing another facial tool that is to be a cheaper option to the ever wanted Clarasonic that may cost you around RM600 per set. This is a more affordable option and let see what I have to say about it. Describe as a tool that gives you these vivid results by removing the layers that life puts on. Up to twice a week, use the Microderm Setting with the microdermabrasion Foam Head and Thermal Crystal Polisher to exfoliate 7x better than the scrub alone. You'll gently help treat the appearance of imperfections, dull patches and surface discoloration for a visibly improved texture and a more even skin tone. Kinda like an exfoliator tool for during your cleanser routine. This is also the new and improve from the last version called Olay Pro-X. The box came with a 3 Speed Facial Cleansing System , Microdermabrasion Foam Head , Cleansing Brush Head , Thermal Crystal Polisher (0.68 fl. oz.) , Exfoliating Renewal Cleanser (0.68 fl. oz.) , & 2 AA Duracell Batteries . The 3 Speed Facial Cleansing System is made out of a sturdy plastic. The handle is pretty firm and nice on the hand. It also comes with a 2 different interchangeable brush head that I find easy to insert and replace with one another. One is called the Cleansing Brush Head and another one is called the Microdermabrasion Foam Head (the flat surface brush head). This tool operates with 2 AA batteries. Batteries included! I find that the batery section closure is quite safe if you happen to run under water because I find hard time opening the closure and it stays firm after you close it but still I find a bit scare and a bit hard to avoid water from running through the handle because I am afraid I will broke it. 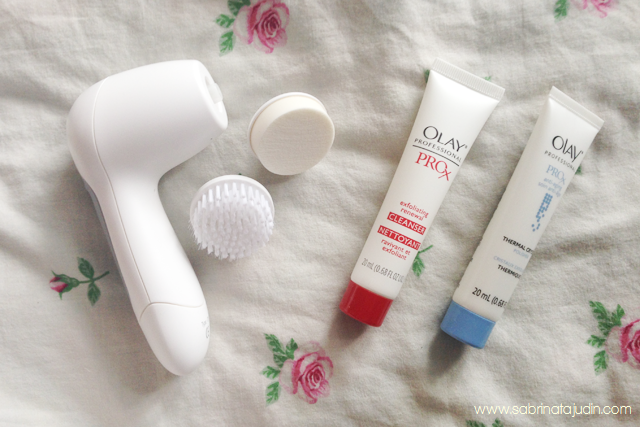 Using the Cleansing Brush Head + Exfoliating Renewal Cleanser (Red cap). The brush head is made out of a soft-fiber bristles. It pretty soft and kinda reminds me of a soft 0.02 type of toothbrush. The cleanser that it provides with is pretty good but I prefer using my own cleanser. As you run through the brush on your face on low speed it kinda feel gentle but if you increase it to the higher speed which is 2x or 3x, it may feels a bit harsh. The different I find after using this tool and comparing it to the usual cleansing routine is that when I use toner, there is not a bit of makeup residue on the cotton pad. This shows that my skin is really cleanse with this tool. Using the Microdermabrasion Foam Head with + Thermal Crystal Polisher (Blue Cap). This is like a polisher to your face. When I first try it, it really shocked me. The cleanser it self is pretty grainy and a nit rough. It makes my face turn red but my skin feels so soft. Although it gave me such result I son't feel like I wanna use it everyday. It tends to feel a bit harsh. As you go through your face, there is a white flakes coming out on your face. Maybe because of the reaction from the cleanser it self and to your skin that contains dirt. My overall thoughts. It a pretty good product that I find a great option to include and really have that proper cleansing routine especially during the night after you remove your makeup. I never tried clarasonic but I have tested it and hold it while I was at Sephora while ago. The difference between both of them are probably on how the brush head are turn and the size of the brush head. 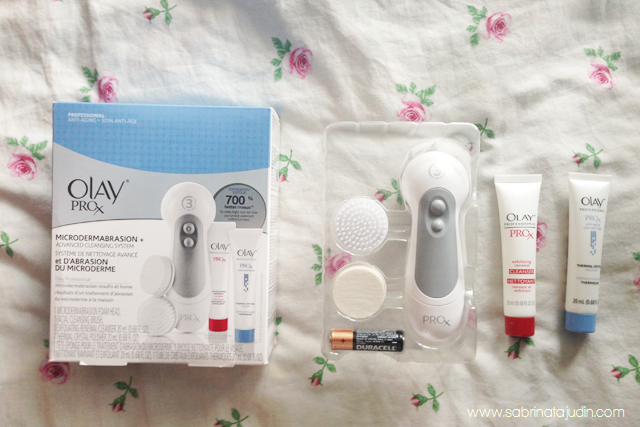 The Olay Professsioal head turns clockwise/rotates and some water will split out around while you using it. The bubbles and foams tends to get out if the brush and to the sides which sometimes annoys me. But overall on how it feels on my skin, I really felt that this tool help to clean my face effectively. I only use the cleansing brush during the night and the Microdermabrasion Foam Head once a month maybe because it pretty harsh on my skin. You can also use your own cleanser if you like, like what I usually do. I don't really like the facial cleanser it comes with. The speed is also quite convenient, and I can suggest that yoiu need to try each of the speeds depends on how you feel like or skin types. Why you need this. This helps to exfoliate and remove dirt from your skin effectively. tak sakit but jangan lama2 or rasa harsh sikit on the skin. sebab brush dia rotate ke satu arah... the bristles is pretty soft, so kene adjust the speed to your liking, pretty nice and your skin feel clean la..